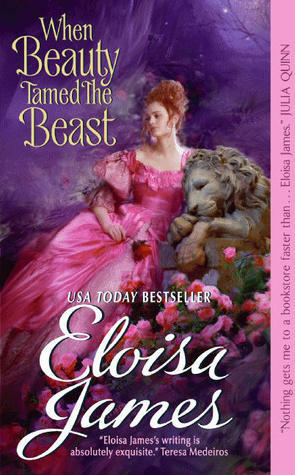 Eloisa James’ brand-new release When Beauty Tamed the Beauty managed to effortlessly tame this reader! A delightful story with vivid, genuinely funny characters, When Beauty Tamed the Beast combines elements of the classic fairy tale with the more modern story of House M.D.‘s cantankerous doc, Gregory House. Linnet Thrynne is the kind of beautiful woman that brings men to their knees. Unfortunately, it’s her own sullied reputation that brings her low, and her flighty father and melodramatic aunt Zenobia decide to pack her off to Wales as the bride of a beastly earl (and physician) Piers Yelverton. What nobody counts on is that beauty doesn’t mean “biddable” and beastly doesn’t mean “brooding.” (Yes, Piers isn’t some crabby loner hanging out in a turret.) As their preconceived notions are set aside, Linnet and Piers form a friendship, engaging in early morning swims and day-long banter. They really get to know each other, and the reader gets to know them, as well as Piers’ parents and his eccentric household/hospital — including his rather awesome butler, Prufrock, who isn’t very butler-ly at all. The dialogue just crackles. I had so many laugh out loud moments, starting right from the first few pages. When Linnet’s disapproving chaperone says she looks like a “light frigate” (a woman who docks in too many harbors, if you get the drift…), she quips, “Even a very young light frigate should have the chance to dock at one harbor before she’s scuppered.” By the time our astute young frigate drops anchor with Piers, the reader knows she has much more to offer than just a devastatingly powerful smile — and, throughout the course of the story, Linnet learns the same thing. As for Piers, he’s not nearly as much of a jerk as House and not as isolated as the Beast. He’s somewhere in the middle, a crack diagnostician who can’t really diagnose his own malady. Fortunately, as you might expect, Linnet is the cure for what ails him! Like any trip, this rollicking journey to happily ever after isn’t without some bumps (things take a serious turn at the end, and the awesome Prufrock sort of vanishes after a while), but you’re so invested in Linnet and Piers that it’s easy to ride out the rough spots!